A legacy built on a track record of customer-centred successful operations. 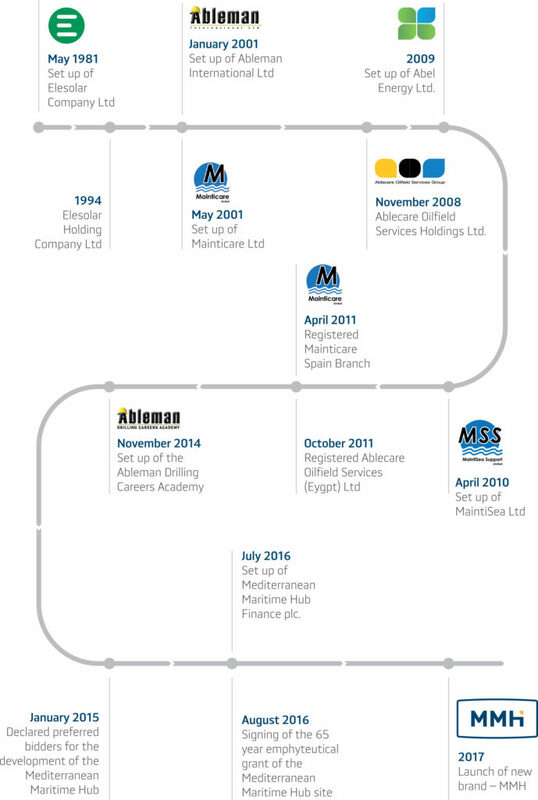 The technical and reputational standing of MMH Malta Ltd. is attributed to the vast experienced gained from the founding companies over these last 35 years. The very beginnings stem from Elesolar Company Ltd, founded in 1981 by Paul Abela. The Company was involved and contributed to a number of major private and national landmark building services engineering projects which were undertaken during that time in Malta. In 2000, Elesolar Company Ltd shifted its core business from the building Engineering Services sector and moved to a more specialized and growing business sector, relating to the Oil & Gas Offshore Industry. This move was followed up by the setting up of two companies in 2001, Ableman International Limited which specialized in Human Resource Management, and Manticare Ltd which specialized in the Maintenance, Engineering and Logistics for the Oil and Gas Offshore Industry with particular focus on the provision of these services to Drilling Contractors. In 2008, these two companies formed Ablecare Oilfield Services Group. Over these last two decades the Group has gained extensive experience in providing services and products to these industries through a one stop shop approach. The Group also established itself regionally and in 2014 launched the Ableman Drilling Careers Academy. In 2016, the Maltese Government has entered into a 65-year emphyteutical grant with theGroup to develop, manage and operate the facilities at the former Marsa Shipyard in Valletta Port, transforming them into The Mediterranean Maritime Hub; a world class regional hub capable of supporting and sustaining the most challenging and complex oil and gas industry operations, anywhere in the Mediterranean and North African Region. In order to ensure a seamless and holistic supply chain, the Group’s subsidiaries, Mainticare Ltd, Ableman International Ltd and the Ableman Academy, have been amalgamated into MMH Malta Ltd, a single, integrated organisation; customer-focused and easy to access. This step forward is being effected in order to further consolidate our operations along our ‘One group – one solution’ ethos, and by means of which we aim to convey holistic solutions through MMH, with the highest levels of reliability and expertise. MMH supports both the marine and the oil and gas sectors and inherits an established reputation for service and quality from its predecessors. MMH will build on this reputation to expand the scope of services offered and ensure that MMH excellence is available to your organisation, wherever you’re operating in the Mediterranean.